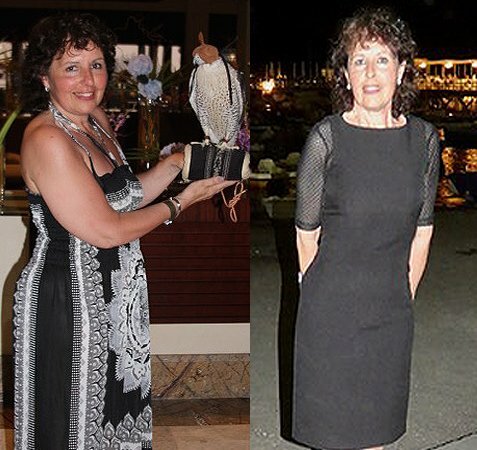 Fitgirlslim member Joyce Thatcher, 62. I first thought about the clean eating programme back in July 2016. My weight had been increasing steadily for over a year and I was finding the exercise classes harder. I had no energy and it was affecting my asthma. I needed motivation and a plan to get me back on track and hearing all the amazing results from the other class members following the plan, I was interested! The diet was very easy to follow, there were many recipes to choose from and I enjoyed experimenting in the kitchen. The hardest thing was giving up tea and coffee, I used to have 6-8 cups a day but after a few days abstinence I felt and slept so much better. Now it’s hot water with a slice of lemon every morning and it’s more refreshing. I no longer crave coffee but I still have the odd cappuccino and thoroughly enjoy it. My taste buds have actually changed. I prefer this way of eating and automatically choosing the healthy options. It worked. In 2 weeks I had lost 7lbs. By February 2017 I was 1 stone 10lbs lighter and had dropped from a size 12 to a size 8 (I am petite at 5 feet tall). I can honestly say this is the only time I’ve lost weight over my whole body including the areas I’ve struggled to lose weight from before. I am thrilled. It’s totally changed the way I look at food. I’d always loved fruit but now know how much sugar it contains I opt for berries instead. I used to avoid nuts, believing they were fattening but since including them I’ve seen an improvement in my hair, skin and nails. I sleep well, have more energy and am enjoying my exercise classes again. I feel so much better. This is the best weight loss plan I’ve ever tried and there have been quite a few over the years. Everyone has noticed I’ve lost weight, I get complimented on how slim and well I look and they all ask how I managed to achieve my goal. I’d recommend it to anyone. As you get older it’s harder to stay in shape and at 62 I’m amazed how effective it was. I’m now wearing my daughter’s size 8 jeans, but she had to convince me they would fit. There is definitely no going back, I feel great.